With an impressive list of winners down the years that includes Martyn Irvine and Ian Richardson, the 2018 edition of the Noel Hammond Memorial TT has gone to Conn McDunphy. In the women’s race Eve McCrystal (Garda CC) was best in a time of 51:05; a new women’s course record. Jennifer Bates (Team Gerard-DHL) was next with a time of 56:33. The contest was held in perfect conditions in Roundwood, Co Wicklow, with McDunphy flying around the 32.5km course. 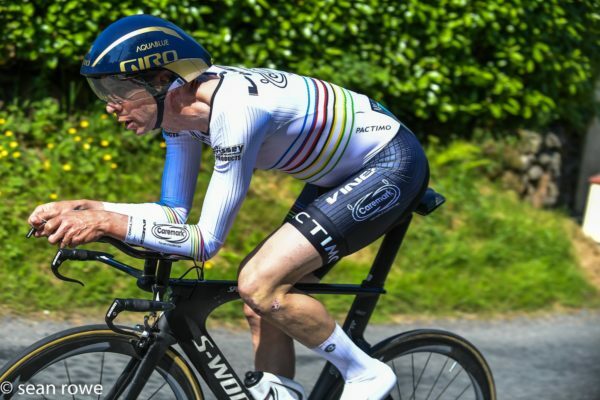 He was 30 seconds ahead of Neil Delahaye (Fixx Rouleurs), with world masters TT champion Greg Swinand (Viner-Caremark-Pactimo) next, 2:02 behind the winner. McDunphy took silver in the U23 TT at the national championships last year. And having already checked out the course for the championships in three weeks time, he will be one of the favourites for a medal. Swinand in his world champ’s kit. 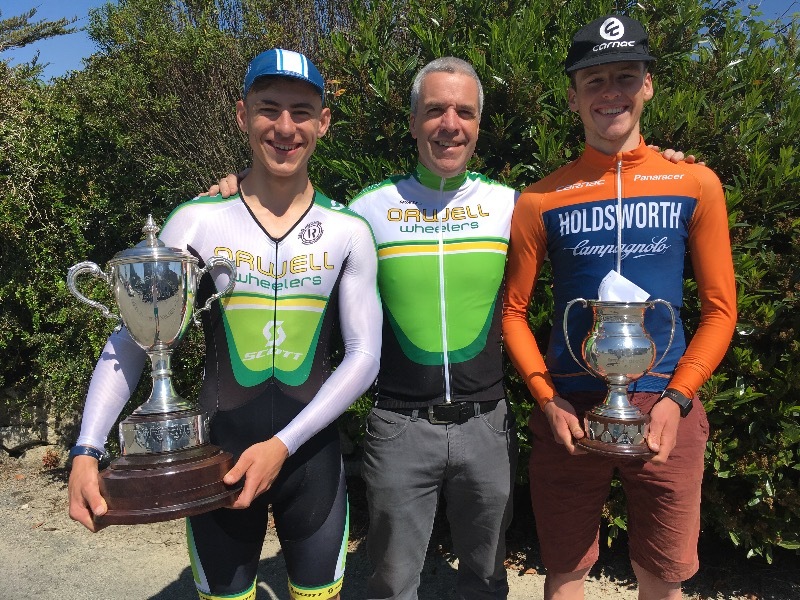 Aidan Hammond with the winners – Dimitri Griffin and Conn McDunphy – of the trophies dedicated to his father and brother. 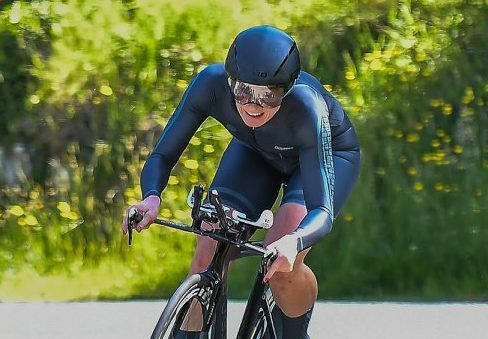 Eve McCrystal with her race face on as she powers to a new women’s record. Two other men in the field who will have the masters championships in mind were Delahaye and Swinand. They have both won masters crowns in the past and will be looking to do the same this year. Swinand, who has now moved into the Masters 50 range is the world champion in that category. And he race today in his world champion’s rainbow bands. 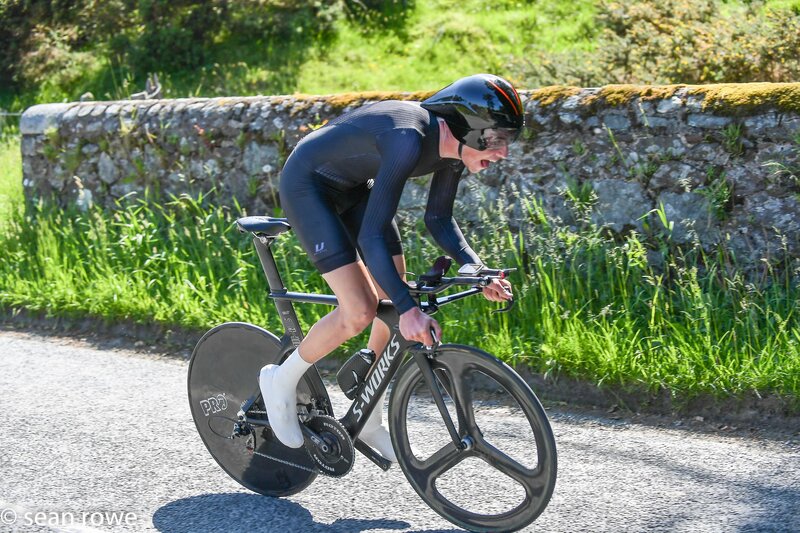 After the top three today, Eoin Byrne of promoting club Scott Orwell Wheelers took 4th, in a new club record of 48:51. He was followed by team mate Balasz Galambos and Eoin Ahern; clocking times of 49:28 and 49:57 respectively. While McDunphy was taking the elite race, the Kieran Hammond trophy went to Dimitri Griffin of Scott Orwell Wheelers.